Florian Cafe: Poetrees: First Review! FLORIAN, Douglas. Poetrees. illus. by author. 48p. glossary. CIP. S & S/Beach Lane Bks. Mar. 2010. RTE $16.99. ISBN 978-1-4169-8672-0. LC 2009003025. 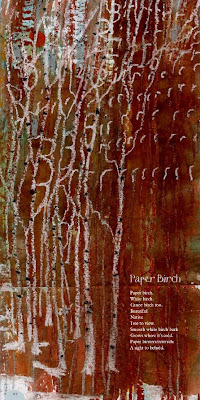 And here is the poem on the paper birch tree, native to America and known by at least three names. It usually grows where it's c-c-cold. And great poem. I love birches--they're my favorite. We have a river birch (but no river) in our backyard--the only tree I've ever planted that has thrived. Thanks jama and laurasalas. Birch trees are also a favorite of mine but they struggle to survive in New York City. We have river birches around here...they really are so neat. The birch trees are beautiful at my dad's cabin in northern Wisconsin. Love the birrrrrrrch! I jotted your name in my *Daily Planner* and you're visiting my class (well, Professor Sloan's class that I'm IN) @ Queens College May 4th. I'm anxious to meet you and excited to get to know your work in the meantime. Congratulations! It looks and sounds like a wonderful book, can't wait to get my hands on a copy. Lovely! Will be on the lookout for it. We love your work Douglas Florian! And by "we" I mean my ESL students and I! You are out of this world!